Frank Einstein is known for his monsters... and his factory makes the best monsters bar none. 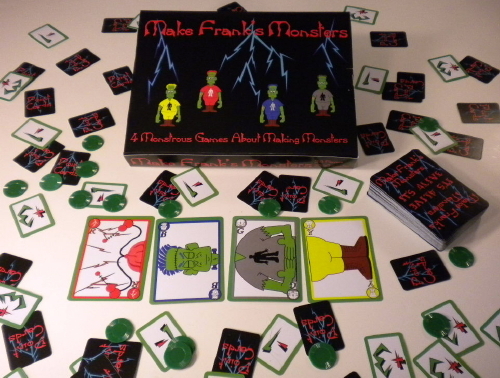 Make Frank's Monsters is four different card games that can be played with the same deck of cards. Although each of the four games are a little different in theme and play; basically you are trying to build monsters by getting the four different cards needed (the Lightning Bolt /Helmet, the Head, the Arms/Torso and the Legs) to complete a monster and score points. But, when things don't quite workout you can lose points. Starting with Make Frank's Monsters 1, each of the four games are a little more complex and strategic then the previous game. The deck consists of 64 cards: the 4 types of cards, in 4 different colors (Red, Blue, Yellow and Gray) with 4 of each card in the deck. In the first two games the colors are not used, but in the last two they are. There are also two kinds of tokens (the +3 tokens and the -1 tokens) which are used for scoring. You can play 4 different games. You get to build the monsters.